The U.S. Air Force's robotic X-37B space plane has celebrated a silent anniversary, surpassing an entire year in Earth orbit on a mystery mission for American military. Meanwhile, a third X-37B space plane mission is being readied, and could even launch later this year, SPACE.com has learned. The X-37B space plane currently orbiting Earth is the second spacecraft of its kind built for the Air Force by Boeing’s Phantom Works. Known as the Orbital Test Vehicle 2, or OTV-2, its classified mission is under the wing of the Air Force Rapid Capabilities Office. What the robotic space plane has been doing in orbit for so long remains a mystery, since Air Force officials have not commented on the flight's details due to its classified nature. Outside experts, however, have suggested that the flight is testing the limits of the X-37B space plane, or possibly serving as an orbital spy platform. McIntyre dropped no hints, except to suggest that the next X-37B flight could launch later this year. "Upon completion of all objectives, we look forward to bringing the mission to a safe, successful conclusion. 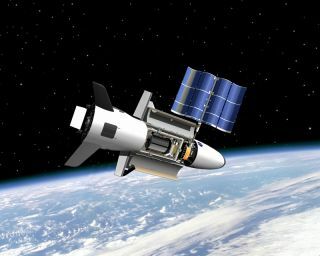 The next program phase, the third X-37B mission, has been tentatively planned for the fall of 2012," McIntyre said. Each X-37B space plane is about 29 feet (8.8 meters) long and 15 feet (4.5 meters) wide. It has a payload bay about the size of a pickup truck bed. It is outfitted with a deployable solar array power system. What’s inside that payload bay, and what functions they serve, are classified. Like NASA's now-retired space shuttle, the X-37B space planes are capable of returning experiments to Earth for inspection and analysis, as well as re-flight of equipment. The maiden voyage of an X-37B space plane, the OTV-1 mission, launched in 2010 on a flight that lasted 225 days. That initial mission spacecraft lifted off on April 22 and landed on Dec. 3, gliding onto a specially prepared runway at Vandenberg Air Force Base in California. Bunko said the flight of the vehicle is being extending as circumstances allow, in order to obtain maximum value out of the mission. "We don’t know when we'll land, but we regularly evaluate that based on test objectives." The X-37B space plane originated as a NASA spacecraft research project, but lack of funding led the agency to transfer the program to the Defense Advanced Research Agency in 2004. The Air Force took control of the project in 2006, and has launched two apparently successful missions so far. Ted Molczan, a Toronto, Canada-based satellite watcher and spacecraft analyst, offered his view of what the X-37B space plane might be up to. In an Internet posting to his fellow amateur skywatchers, Molczan said the X-37B's altitude has changed little since launch, and it has been at about 331 kilometers by 342 kilometers. The OTV-2 spacecraft's ground track repeats after every 31 revolutions, in just under two days, Molczan added. The mission of the first X-37B vehicle operated in several different orbits, most of which repeated every two to four days, he said. Molczan and other skywatchers have also managed to catch video of the X-37B space plane in orbit as it sailed across the night sky. Whenever this second X-37B mission concludes, the craft is designed to make a "do-it-itself" guided entry and wheels-down runway landing at Vandenberg Air Force Base in California. An alternate desert landing site is neighboring Edwards Air Force Base, Calif., mission officials have said.